Michigan is №.1 in clean energy jobs. But for how long? Every day the Midwest’s economy becomes more energy efficient, relies on more megawatts of electricity generated from renewable technologies like wind and solar, and uses an ever-expanding fleet of electric vehicles (EV) to transport people and goods. Against this backdrop, Midwestern states have for the past few years been locked in a pitched battle with each other to create the kind of environment that allows for clean energy companies to thrive and create more local jobs. We are the two Michiganders involved in different aspects of Michigan’s clean energy sector — one of us is a business development director at a Detroit-area energy efficiency company, the other a West Michigan-based senior manager at one of the country’s largest utility-scale wind and solar developers. From our perspective in the industry, the best way for Michigan to sharpen its competitive edge in clean energy is to leverage the power of smart energy policies. And there are three things utilities and lawmakers in Michigan and Washington, D.C. can do right now to keep the next generation of clean energy entrepreneurs — and the high-growth businesses they create — right here in Michigan. First, our major utilities — Consumers Energy and DTE — need to double-down on clean energy. Recently, Consumers took a positive step in this direction by filing a long-term plan with the Michigan Public Service Commission explaining how it will scale up solar, energy storage, and energy efficiency to transition completely away from coal-fired power plants by 2040. This will help cut Consumers’ carbon emissions 80 percent by 2040 compared to 2005 levels. DTE has signaled it too is willing to invest in clean energy, with more than $1 billion in renewables investments slated by 2020. That’s in addition to the $2.5 billion DTE has already invested in Michigan’s renewable energy sector. Similar to Consumers, DTE’s goal is to cut its carbon emissions 80 percent by 2050. Second, Washington lawmakers have to stop slamming the brakes on common sense clean vehicle policies. For example, reversing CAFE emissions standards, as the Trump administration recently signaled it intends to do, is creating regulatory chaos in Detroit. As automakers and car dealers juggle one set of constantly changing standards from the federal government, and another set from states with major auto markets like California, this uncertainty drags down private investment and shoots up consumers’ costs. Third, Congress and the White House must maintain funding for programs at the U.S. Department of Energy and the U.S. Environmental Protection Agency that help commercialize game-changing clean energy technologies. From airplanes to the internet, America has a lucrative tradition of innovation and federal-level R&D support. As the world transitions to an economy powered by clean energy and EVs, we can’t afford to lose out to countries like China, India, and Germany. If lawmakers want hard evidence that clean energy and clean transportation expands our economy by attracting businesses and jobs, they should download the just-released Clean Jobs Midwest report from the national, nonpartisan business group E2 (Environmental Entrepreneurs) and Chicago-based Clean Energy Trust. 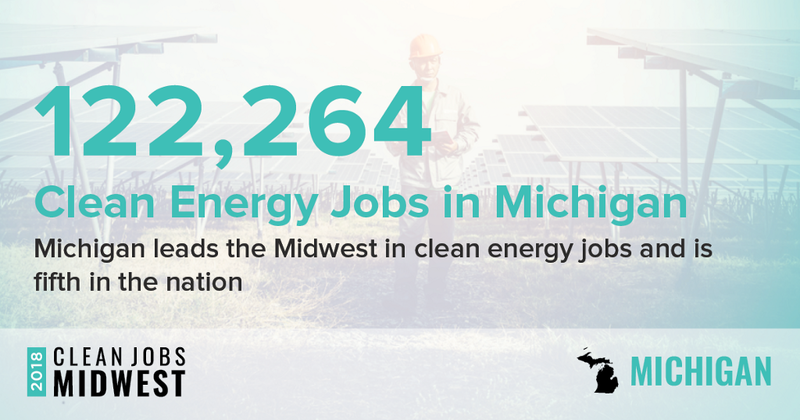 The report shows 710,000 clean energy jobs in the 12-state region, including 122,000 in Michigan alone — №1 in the Midwest. The vast majority of these Michigan jobs — some 84,000 — are at energy efficiency companies, but renewables including solar (5,500 jobs) and wind (4,700 jobs) are also major employers, while clean transportation helps put food on the table for nearly 22,000 Michiganders. Michigan has an opportunity to build upon its status as the top clean energy employer in the Midwest and the hub of America’s clean transportation industry. We can start by encouraging DTE to improve its long-term energy plan, and by letting lawmakers in Lansing and D.C. know that strengthening clean energy and clean transportation policies now creates economic growth and good Michigan jobs for decades to come. Malcolm Miller is director of business development at Walker-Miller Energy Services, a Detroit based, woman-owned business that trains and employs energy efficiency and clean energy workers. Brad Pnazek is a West Michigan-based senior development manager at Tradewind Energy Inc., which has developed $5 billion worth of wind and solar projects since its founding in 2003. Michigan is №.1 in clean energy jobs. But for how long? was originally published in e2org on Medium.